The 2015 Infiniti Q60 Coupe once again stands alone with its seductive styling, exhilarating performance and luxuriously crafted interior. For 2015, two new models have been added to the lineup, the Q60S Coupe Limited and Q60S Coupe Limited 6MT, with each offering an even higher level of sporty design, suspension tuning and interior features than the standard Q60 Coupe. The Infiniti Q60 Coupe is now offered in five models: Q60 Coupe Journey, Q60 Coupe AWD, Q60S Coupe 6MT, Q60S Coupe Limited and Q60S Coupe Limited 6MT. The Infiniti Q60 is also available in a dramatic hardtop convertible model, the Infiniti Q60 Convertible (for full information, please go to infinitinews.com). The 2015 Infiniti Q60 Coupe’s smooth, aerodynamic design offers flowing front fender curves, a wave-style hood, expressive front fascia with Infiniti’s signature double-arch grille and L-shaped High-Intensity Discharge (HID) bi-functional xenon headlights. The front fascia includes standard fog lights in the lower fascia area, while the strong side character line and side sills integrate with the large wheel wells and performance-oriented wheel and tire packages to transmit an added sense of power and vibrancy. The rear of the Q60 Coupe features broad rear fenders flowing into the large LED taillights, refined rear bumper, integrated RearView Monitor camera, rear underbody air diffusers and large dual exhaust outlets with chrome finishers. The Q60S Coupe 6MT and Q60 Coupe models with Sport Package add an enhanced performance look, with a unique front fascia and standard 19-inch aluminum-alloy wheels with high performance tires. Eight exterior colors are offered: Blue Slate, Venetian Ruby, Malbec Black, Liquid Platinum, Graphite Shadow, Black Obsidian and new-for-2015 Majestic White and Hagane Blue. The Q60 Coupe’s interior design features sophisticated craftsmanship, with a cockpit-oriented front driver and passenger area, Infiniti signature “double wave” instrument panel design featuring an Infiniti signature analog clock and dramatic, full-length center console with a leather and aluminum-clad shifter. “Silk Obi” aluminum interior trim adds a unique look to the instrument panel, center console and door panels. The instrument panel includes Infiniti electroluminescent instrumentation with white illumination and integrated multi-function information drive computer display (average fuel consumption, real-time fuel economy, average speed, elapsed time, running distance, distance to empty, outside air temperature, warning displays, odometer and automatic transmission shift indicator). A standard double hand-stitched leather-covered steering wheel is designed for maximum comfort and usability, with standard wheel-mounted audio and cruise controls. Solid magnesium paddle shifters are available for the 7-speed automatic transmission (Sport Package). The 8-way power driver and front passenger seats are appointed with Infiniti’s exclusive premium leather and feature 2-way adjustable head restraints and a unique rear-seat access system (the front seats move forward automatically at the touch of a button to allow passengers into the rear seats). The Q60S Coupe 6MT and optional Sport Package add special sport-styled seats with thigh extensions and power adjustable torso and thigh bolsters for the driver, unique steering wheel stitching (except Stone interior) and high-grip aluminum pedals. Technology and convenience features include the Infiniti Intelligent Key with Push Button Ignition, Remote Keyless Entry system, a tilt/telescoping steering column with increased travel, illuminated glove compartment and automatic temperature control. Also standard is a 6-speaker AM/FM/CD audio system with MP3 playback capability, Radio Data System (RDS) and center console-mounted auxiliary input, as well as a 7-inch color display and SiriusXM Satellite Radio (SiriusXM subscription required, sold separately). An 11-speaker Infiniti Studio on Wheels® by Bose® with a 3-way front door speaker array using 10-inch woofers is standard on the Q60S Coupe 6MT model and optionally available on Q60 Coupe Journey and Q60 Coupe AWD models. The available Infiniti Hard Drive Navigation System features NavTraffic Real-Time Traffic Information and NavWeather with Real-Time Weather and 3-day forecast (SiriusXM® subscription required, sold separately). Two interior color combinations are offered – Graphite and a Stone interior with high contrast Graphite components. All 2015 Infiniti Q60 Coupes, including the new Limited models, come equipped with a 3.7-liter VQ-series V6 with VVEL (for Variable Valve Event and Lift) rated at 330 horsepower and 270 lb-ft of torque. The VVEL system combines hydraulic-controlled variable valve timing and electronically controlled variable valve lift on the intake side to help improve performance and response. The intake camshafts, featuring continuously variable lift control teamed with the Continuously Variable Valve Timing Control System (CVTCS), allow for a 7,500-rpm redline. The engine also features ladder frame construction, large crank journal and pin diameters, asymmetric piston skirts, twin knock sensors, an electronically controlled “drive-by-wire” throttle system, lightweight pistons, Iridium spark plugs and a symmetric twin air intake system. The specially tuned dual exhaust system features equal length exhaust manifolds and low muffler exhaust backpressure to help improve engine breathing. 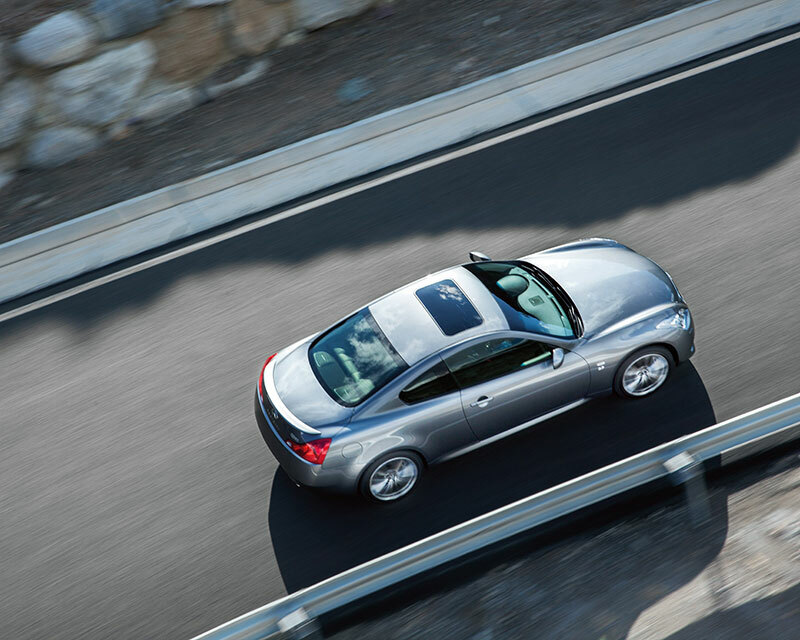 Infiniti Q60S Coupe Limited models include a stainless steel sport muffler. The engine is backed by a choice of an electronically controlled 7-speed automatic transmission with manual mode, downshift rev matching, Drive Sport (DS) mode and Adaptive Shift Control (ASC) that allows for quicker shifts in sporty driving situations and available solid magnesium paddle shifters; or a responsive, lightweight 6-speed manual transmission. The foundation for the Q60 Coupe’s impressive handling and ride performance comes from its second-generation FM (Front Mid-ship) platform. The 4-wheel independent suspension design features lightweight aluminum components and large front and rear stabilizer bars. The front suspension is a double-wishbone design, with a single pivot lower wishbone and a long upper link, while the multi-link rear suspension separates the shock absorbers and springs, locating the shock absorber inline with the wheel center. These designs help minimize alignment changes and reduce suspension friction for more nimble handling and smoother riding characteristics. Responsive steering is provided by a vehicle-speed-sensing design, which provides optimum steering effort at both high and low vehicle speeds. Vehicle Dynamic Control (VDC) is standard on all models. For buyers looking for the added performance of all-wheel drive, the Q60 Coupe AWD comes with Infiniti’s advanced ATTESA E-TS (Advanced Total Traction Engineering System for All Electronic Torque Split) all-wheel drive system. The system utilizes an active torque distribution management system with an active center clutch. The electromagnetic AWD system responds more quickly and precisely than conventional hydraulic AWD systems, with minimal compromise of rear-wheel drive performance characteristics on dry roads. Monitoring wheel spin, throttle position and vehicle speed, it automatically diverts up to 50 percent of available power to the front wheels, helping enhance traction when road conditions are less than optimal. When all-wheel drive is not needed, the system can send up to 100 percent of the power to the rear wheels, preserving the Q60 Coupe’s sporty rear-wheel drive characteristics. Braking performance is provided by standard 4-wheel vented discs with 4-channel, 4-sensor Anti-lock Braking System (ABS), Electronic Brake force Distribution (EBD) and Brake Assist. The Q60S Coupe 6MT and Q60S Limited models are further enhanced with aluminum four-piston calipers (front)/two-piston calipers (rear) embossed with Infiniti lettering and large ventilated rotors – 14.0-inch front and 13.8-inch rear (also available with the Sport Package). Offered as part of the Technology Package are Infiniti’s Intelligent Cruise Control (ICC) and Brake Assist with Preview Braking. ICC automatically adjusts vehicle speed to help maintain a preset following distance to a vehicle ahead. Preview Braking identifies potential sudden braking situations by monitoring the distance and relative speed of a vehicle ahead in the same lane and pre-pressurizes the braking system to help improve braking response if the brakes are applied. The Q60 Coupe Journey and Q60 Coupe AWD models come equipped with standard 18-inch aluminum-alloy wheels with 225/50VR18 all-season tires. A Performance Tire & Wheel Package with 19-inch lightweight cast aluminum wheels and high performance tires is also available for the Q60 Coupe Journey. A Tire Pressure Monitoring System (TPMS) is standard on all models. Enhancing the already high level of dynamic performance of the Q60S Coupe 6MT, Q60 Coupe Journey and Q60 Coupe AWD with Sport Package are a unique sport suspension, a Viscous Limited Slip Differential (VLSD) and 19×8.5-inch front wheels with 225/45WR19 front tires and 19×9.0-inch rear wheels with 245/40WR19 rear tires (Q60 Coupe AWD with Sport Package features front and rear 225/45R19 tires). Every 2015 Q60 Coupe is available with a long list of standard safety and security features, including an Advanced Air Bag System (AABS) with dual-stage supplemental front air bags with seat belt sensors and occupant classification sensor, roof-mounted curtain side-impact supplemental air bags for front and rear-seat outboard occupant head protection and front seat-mounted side-impact supplemental air bags. Also standard are 3-point ALR/ELR seat belts (driver’s side ELR only) and front seat belts with pretensioners and load limiters, front seat Active Head Restraints and the LATCH System (Lower Anchors and Tethers for CHildren). Available as part of the Technology Package are Front-seat Pre-Crash Seat Belts. Under certain braking conditions, they automatically tighten the front seat belts to help restrain you. Building on the extremely well equipped Infiniti Q60 Coupe Journey, the two new 2015 Infiniti Coupe Q60S Limited models add an even higher level of sporty exterior appearance, suspension tuning and interior features. Unique enhancements include a Midnight Black grille, black exterior mirror covers, black rear trunk spoiler, sport-tuned performance suspension, stainless steel sport muffler, contrast interior stitching, contrast stitching on steering wheel. Combined with the exclusive 19-inch split 7-spoke gloss black finish wheels and low-profile Bridgestone Potenza RE050A performance tires, the Q60S Coupe Limited projects a confident stance and road-ready attitude. The Q60S Coupe Limited also offers a sport-tuned steering gear and 4-wheel sport brakes (14-inch front, 13.8-inch rear) with aluminum-alloy opposed calipers (4-piston front/2-piston rear) and Viscous Limited-Slip Differential (VLSD). Solid magnesium paddle shifters are standard with the 7-speed automatic transmission. Other standard features include the 11-speaker Infiniti Studio on Wheels® by Bose® audio system, Infiniti Navigation System, Bluetooth® Advanced Audio Distribution Profile, Infiniti Voice Recognition for audio navigation, DVD-video playback, Rear Sonar, power sliding glass panel moonroof and memory system for driver’s seat, steering wheel and outside mirrors. 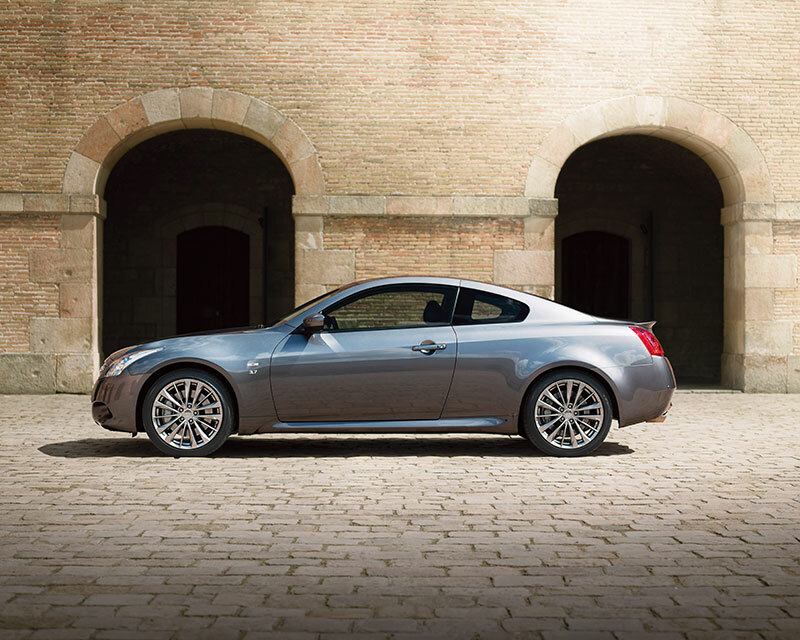 The Q60S Coupe Limited is offered in three exterior colors: Graphite Shadow, Majestic White and Venetian Ruby. 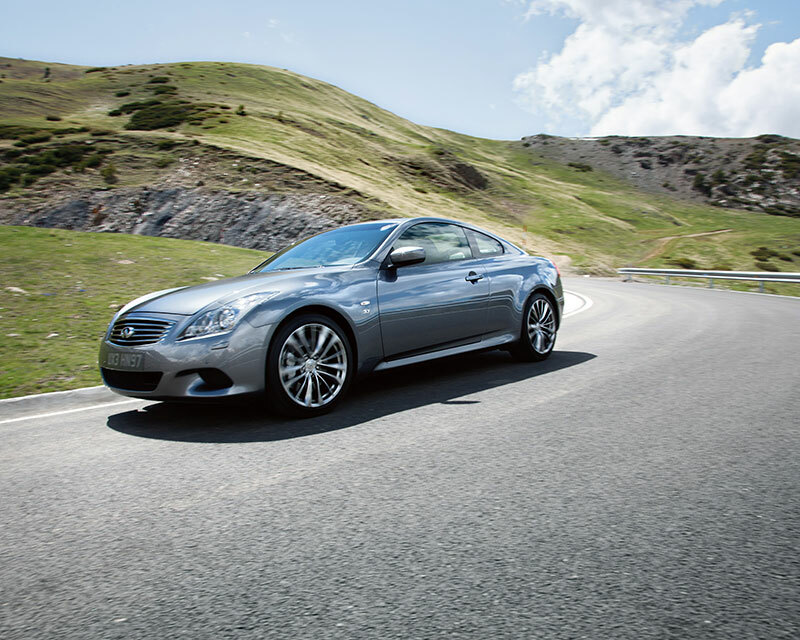 Along with the long list of standard luxury and performance equipment, the 2015 Infiniti Q60 Coupe Journey and Q60 Coupe AWD models are offered with six option packages. 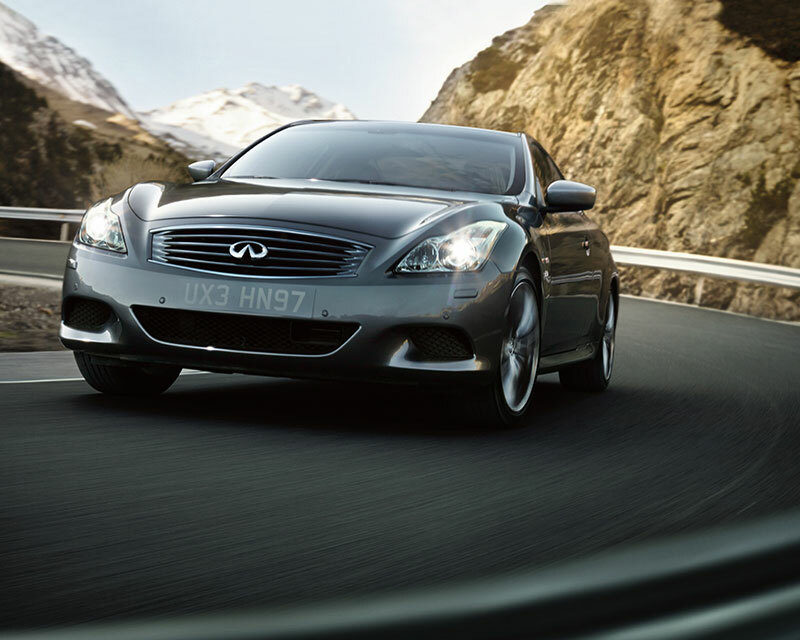 No options are available with the Q60S Coupe 6MT, Q60S Coupe Limited or Q60S Coupe Limited 6MT. The Premium Package includes a power sliding glass moonroof, 11-speaker Infiniti Studio on Wheels® by Bose® audio system, memory system with synchronization, driver’s seat power lumbar support, power tilt and telescoping steering wheel and Rear Sonar System. Also available is the Sport Package (standard on Q60S Coupe 6MT), which includes 19-inch wheels and high-performance tires, Viscous Limited-Slip Differential (VLSD), sport-tuned suspension, sport brakes, unique front fascia, sport-styled seats and steering wheel stitching, aluminum pedals and paddle shifters (automatic transmission models only). The Infiniti Navigation Package adds navigation system with WVGA display screen, NavTraffic Real-Time Traffic Information, NavWeather with Real-Time Weather and 3-day forecast (SiriusXM subscription required, sold separately), Infiniti Voice Recognition and touch screen. The Technology Package includes Infiniti Intelligent Cruise Control, Brake Assist with Preview Braking, Front Pre-Crash Seat Belts, rain-sensing windshield wipers and Advanced Climate Control System (ACCS) with Plasmacluster® air purifier and Grape polyphenol filter. Also available are the Performance Tire & Wheel Package and Interior Accent Package with high-gloss Maple accent interior trim on the center console, instrument panel and doors.